�New� in our product line are POLYMER Gears for distributors. The Nascar drivers know the advantage of these fine products. We now offer these to the public. Part No. G-351W is for a 351W for the .530 shaft $88.00 ea. Part No. 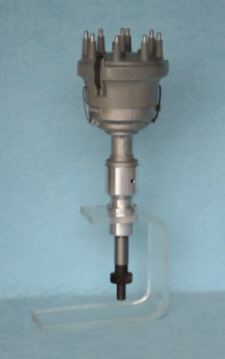 G-C/M/429 is for a 351C, 351M, 400M or a 429/460 for a .530 shaft $148.00 ea. 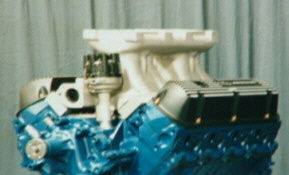 In a few of the PME Intake Adapter Plates a distributor clearance problem occurs. This happens more in the thicker style adapter plates. When this occurs, PME provides a kit to raise the distributor 2 1/2� to clear the water inlet of the distributor. The kit comes complete with instructions and you will be required to measure in thousandths and have the ability to press the pieces together. 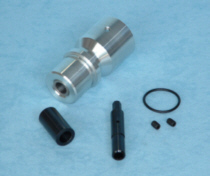 The kit pictured below is an aluminum housing, a soft steel sleeve that presses to the distributor (after you remove the gear and upper pieces) a steel piece that has an internal and an external piece along with two set screws and an oring. Measuring the distributor before you begin is one of the most important things to do in this assembly. If the distributor is not exactly Ford length, the length must be removed or the distributor will stick up out of the block when you are done and you will have to start all over again.